Alarm & Detection | A&D Fire Sprinklers, Inc.
Our experienced technicians install all types of fire alarm systems, Autocall is a fire alarm system that features some of the latest and most advanced fire detection technology available today. The Autocall fire detection systems are combined with advanced technology and proven performance to help ensure customers and their facilities are safe every day. A&D Fire Sprinklers technicians are State Certified and licensed. All of our technicians receive factory training in the equipment we provide. 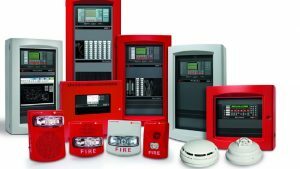 We are able to install all types of fire alarm systems from simple sprinkler monitoring, to complex, voice evacuation systems. We perform on both design & building projects, or simply equipment and install only. Our in-house designers are able to take the project from a conceptual ideal, all the way through to plans and permits including interaction with installers to ensure the installation matches the design intent. A&D Fire Sprinklers provide NFPA 25 and NFPA 72 inspections and certification testing of fire alarms and fire sprinklers systems. A&D Fire Sprinklers can handle your monitoring needs with fast and reliable service. A&D Fire Sprinklers has 24/7 service for emergencies.